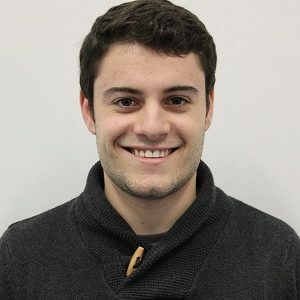 José Miguel Cunha is a Ph.D. student in Nanofabrication for Optoelectronic Application’s group. He was recently awarded by the Portuguese Foundation for Science and Technology (FCT) with an FCT individual PhD grant. Currently, José is focused on the fabrication of passivation layers with different architectures to be used in Cu(In,Ga)Se2 thin film solar cells. Moreover, he has knowledge in electrical characterization of solar cells, namely Capacitance-Voltage, Quantum Efficiency, reflectance measurements and admittance characterization. He has a master’s degree in Micro and Nanotechnologies Engineering at the Faculty of Sciences and Technology, New University of Lisbon. The master’s thesis was developed at INL with the main focus on the study of insulator materials to be used as passivation layer for thin film solar cells. In order to conduct the passivation layer study, Metal-Insulator-Semiconductor (MIS) structures have been developed to do the electrical characterization together with other techniques, specifically Raman, X-ray diffraction and Photoluminescence measurements to support the information provided by electrical measurements. The work of the thesis together with the collaboration of the NOA group members resulted in a paper publication. In 2016, he was a summer student at INL with the project “Fabrication of Micro-Patterned Substrates for Concentrated Micro Solar Cells” supervised by Dr. Pedro Salomé. J. M. V. Cunha, P. A. Fernandes, A. Hultqvist, J. P. Teixeira, S. Bose, B. Vermang, S. Garud, D. Buldu, J. Gaspar, M. Edoff, J. P. Leitão and P. M. P. Salomé. Insulator Materials for Interface Passivation of Cu(In,Ga)Se2 Thin Films. IEEE Journal of Photovoltaics, vol. 8, no. 5, pp. 1313–1319, Sep. 2018. P. M. P. Salomé, B. Vermang, R. Ribeiro-Andrade, J. P. Teixeira, J. M. V. Cunha, M. J. Mendes, S. Haque, J. Borme, H. Águas, E. Fortunato, R. Martins, J. C. González, J. P. Leitão, P. A. Fernandes, M. Edoff and S. Sadewasser. Advanced Materials Interfaces, vol. 5, no. 2, p. 1701101, Jan. 2018. A. Shongalova, M. R. Correia, J. P. Teixeira, J. P. Leitão, J. C. González, S. Ranjbar, S. Garud, B. Vermang, J. M. V. Cunha, P. M. P. Salomé and P. A. Fernandes. Growth of Sb2Se3 thin films by selenization of RF sputtered binary precursors. A. Shongalova, M. R. Correia, B. Vermang, J. M. V. Cunha, P. M. P. Salomé and P. A. Fernandes. MRS Communications, pp. 1–6, May 2018.